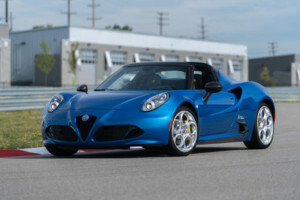 Limited-edition 2020 Alfa Romeo 4C Spider Italia unveiled - AutoInc. AUBURN HILLS, Mich., Feb. 7, 2019 /PRNewswire/ — Alfa Romeo on Friday unveiled the limited-edition 2020 4C Spider Italia for North America, limited to only 15 vehicles. Progressively numbered plate on the center console.